Qatari Defense Minister Khalid Al-Attiyah and his US counterpart, Jim Mattis, completed the $12 billion agreement on Wednesday in Washington, according to the Pentagon. 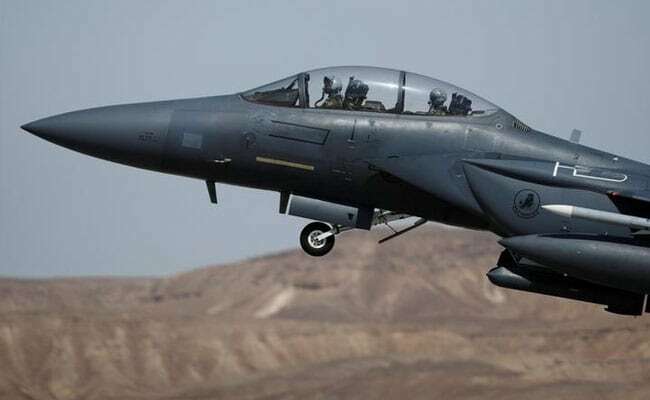 Qatar will sign a deal to buy as many as 36 F-15 jets from the US as the two countries navigate tensions over President Donald Trump's backing for a Saudi-led coalition's move to isolate the country for supporting terrorism. The sale "will give Qatar a state of the art capability and increase security cooperation and interoperability between the United States and Qatar," the Defense Department said in a statement. Congress last year approved a sale of as many as 72 F-15s in an agreement valued at as much as $21 billion, providing authorization for the deal completed Wednesday. But that was before Qatar's neighbors, including Saudi Arabia and United Arab Emirates, severed diplomatic, trade and transport links last week in a move they said was aimed at isolating the country for its support of terrorist groups and Iran. "It is confusing, and the worst thing you want to do in a heated, delicate situation like this is to give mixed messages," Paul Sullivan, a Middle East specialist at Georgetown University in Washington, said of the Pentagon announcement. Qatar's Defense Ministry said the deal would create 60,000 jobs in 42 US states while reducing the burden on US forces. The F-15 accord will lead to "closer strategic collaboration in our fight to counter violent extremism and promote peace and stability in our region and beyond," the ministry said Wednesday in a statement. After the Gulf countries moved against Qatar, Secretary of State Rex Tillerson initially declined to take sides in the crisis, but his cautious stance was overshadowed almost immediately by Trump, who sent a series of tweets that appeared to take credit for and praise the decision. The US position was further muddied last Friday, when Tillerson called on Saudi Arabia to ease the blockade, only to have Trump, at a White House news conference hours later, say the move had been the right one. "The nation of Qatar, unfortunately, has historically been a funder of terrorism at a very high level," Trump said in a speech at the White House last week. "We ask Qatar, and other nations in the region to do more and do it faster. Tillerson has since sought to mediate the dispute from Washington, meeting with Saudi Arabia's foreign minister on Monday. He was scheduled to meet the foreign minister of the UAE -- another member of the Saudi coalition -- for dinner Wednesday night. "I would characterize the mood and the approach to that as being one that is hopeful, that believes that the worst is behind us," State Department spokeswoman Heather Nauert said Tuesday. While Trump appeared to back Saudi Arabia and Tillerson took a more neutral tone, the Defense Department underscored its relations with Qatar, saying the US was grateful to the country for its support of the US presence there. "We encourage all our partners in the region to work towards common solutions that enable regional security," Lieutenant Colonel Damien Pickart, a spokesman for US Air Forces Central Command, said in a statement when the crisis began. Last year, after the State Department approved the jet sale, the Defense Security Cooperation Agency issued a report saying that the proposed sale "enhances the foreign policy and national security of the United State by helping to improve the security of a friendly country and strengthening our strategically important relationship." "Qatar is an important force for political stability and economic progress in the Persian Gulf region," the agency said.